Welcome to the online Child Care Resource Center. Funding for this site is sponsored by the New York State Office of Children and Family Services, funded by the federal Child Care and Development Fund and administered by the Professional Development Program, Rockefeller College, University at Albany. These trainings are available for all child care providers in New York State at no cost to participants. This site is designed to be a resource for information about child care in New York State. OCFS offers online training using several unique and innovative delivery methods to meet the needs of child care providers throughout New York State. OCFS will not approve credit toward required training hours for completing the same online training more than once within a two year period. The website will still allow users to log in and review trainings already completed, allowing trainees to refresh their recollection of previously learned material. Training credit, however, will only be awarded the first time that a specific online course is completed within any two year training period. 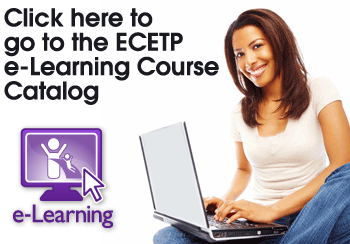 Go to the e-Learning catalog and get started!